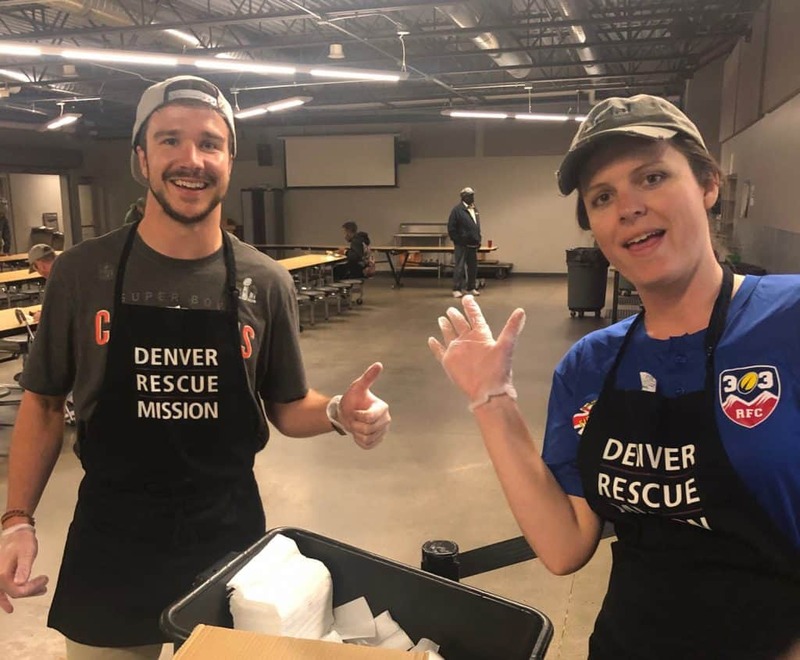 Last week, five Greystone team members participated in a shift with The Denver Rescue Mission for a Volunteer Time Off (VTO) activity. Angela and Michael volunteered for dish duty, as they both have manned a restaurant-style dishwasher in the past and were up for the challenge. The rest of us went out into the dining area to have the most direct contact with all of the guests that would be coming in to eat. A team of high schoolers who came in after us would man the food line – prepping plates and placing them on the end of the counter. We were coached by the facilitator who told us ‘we have plenty of food if they need more food they can go through the line, we have plenty and it’s cold out, so we will have a big crowd tonight!’ He also informed us that they sometimes serve up to 1500 patrons a day! The dining room opened with the disabled eating first. These guests would roll up in their wheelchairs, get scanned and grab their silverware, then get their food or have an assistant help them to be fed. As good as we felt about what we were embarking on, we were also humbled by the fact that these people who were currently warm and being fed, would eventually head outside back into the elements to brave the night, and in many cases spend it alone. A large group of possibly 400 guests filed in for their dinner, all walks of life, shapes and sizes and dispositions. Some with friends some alone. Some hated their vegetables, some told us jokes, many thanked us or asked how we were doing. I frantically rolled plastic forks into napkins to hand out to the guests and did my best to look as many people in the eye and smile. Randy has the great gift of the gab, and made people laugh and engaged as he scanned them in! He was the perfect man for the job – being the first person to interact with them. Ryan rushed around the dining, helping people with their dishes, talking to people, picking up plates, even honoring requests to look for cinnamon buns. He rushed the empty plates to Angela and Michael who were a well-oiled machine back in the kitchen. In fact, by the time we were done with dinner service only a single dish was left to wash! The guests continued to line up for seconds, thirds and fourths, while high school students conversed with them and joked with them. First, the veggies ran out, then the beans, then finally all that was left was the rice and the chicken. The end of dinner was called, and the guests filed out of the dining room as the workers mopped and packed up the tables. At the end of our shift, the aprons came off, we signed out, and headed around the corner to have a beer and celebrate. It was the first time for any of us to have volunteered at a homeless shelter on the food line! I was finally able to do what I had seen in so many Thanksgiving ads, movies, and cards I get in the mail around this holiday season by giving back. Angela mentioned, and we all discussed that in this day in age many people are just a few paychecks away from being on the other side of the serving line. 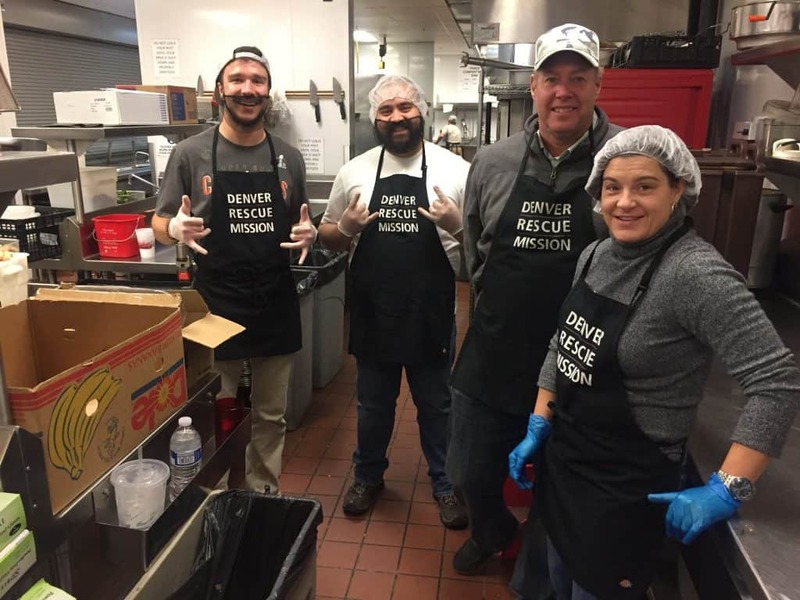 We are all very grateful for what we have and will look forward to doing this again with The Denver Rescue Mission!